Crude oil inventories is a weekly report published by the EIA, Energy Information Administration and covers the inventory report for the previous week. The report marks the weekly increase or decline in the crude oil inventories of oil stored in facilities in the US. 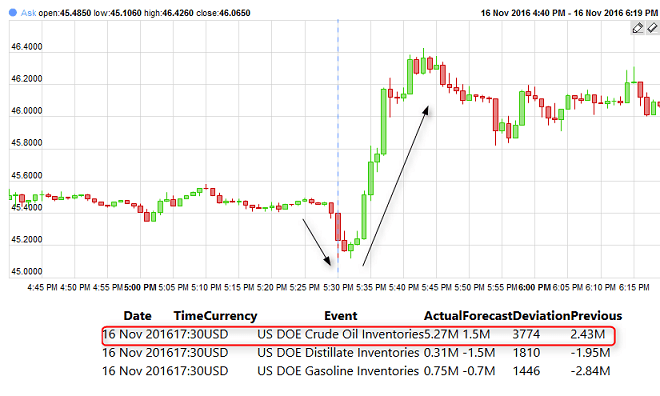 For crude oil traders the inventory report is looked up to, to understand the weekly fluctuations of supply and demand. Broadly speaking, when demand rises, inventories decline thus pushing prices higher and when demand for Crude oil falls, the prices drop in accordance. While the crude oil inventories report is an important news event to take into consideration, Crude oil traders should note that price of Crude oil are also influenced very easily by geo-political events. The Crude Oil Inventories is the actual inventory report of commodities such as crude oil, gasoline, and distillates including jet fuel. The Crude Oil Inventories numbers although doesn’t figure high up in the charts for forex traders are nonetheless monitored very closely by the energy markets. If the Crude Oil Inventories report’s results differ greatly from the anticipated inventory levels, then the markets can react strongly. However, the crude oil inventories report data can be skewed by various seasonal factors and holidays. Although the Crude Oil Inventories report is released weekly, it can be unreliable and hence should be viewed as part of long term trends. A four week moving average is more ideal for traders who want to take a long position when trading crude oil. From a binary options trader’s perspective however, the weekly data release of crude oil inventories makes it ideal to trade crude oil because of the short expiry times. Small movements can make it ideal for binary options traders to make significant profits when trading the crude oil inventories. What does the Crude Oil Inventories Report comprise of? Basically, the Crude oil inventories data is made up of two sets of data. One made up by The American Petroleum Institute, which is a a private group that compiles a voluntary survey of its members and secondly The Energy Information Agency, a U.S. government agency which also acts as an energy adviser to 26 countries made up of OECD compiles mandatory reports from firms within the energy sector and releases the data on Wednesday mornings. Crude Oil inventories report shows the amount of barrels of Crude Oil in stock pile. An increase in inventory indicates slower demand or rising supply which in turn reflects on a bearish Crude prices. Likewise, declines in stockpile reflect increasing demand or under supply. Traders however should not use just the supply and demand to trade Crude Oil. The commodity is highly sensitive to geo-political tensions and more recently is also sensitive to growth data such as GDP from countries such as China and the US. The Crude Oil Inventories report is released every Wednesday at 1500GMT or 1030 EST. In the event that the Wednesday happens to be a holiday, the report is published the next day (Thursday). The report shows the amount of barrels in current stockpiles and thus reflect the supply and demand. Besides the crude oil inventory report, traders should also bear in mind the following factors. Crude Oil Exports: the world’s crude oil producing nations comprise of 15 countries with Saudi Arabia, Russia and the UAE being the top three oil producers. Any hints of political turmoil in these countries could very well affect crude oil prices. OPEC: Organisation of Petroleum exporting countries account for over 81% of Crude oil reserves. The consortium is made up of 13 countries, mostly in the middle east besides Venezuela, Angola, Libya. With an increase in non OPEC oil production, the world relies much lesser on OPEC, although frequent calls on OPEC are made to meet any short comings in supply. Most forex brokers now a days offer crude oil CFD trading as well as few who offer Crude oil futures trading as well. The CFD version of crude oil is depicted by its symbol XTIUSD or USOIL while the futures are depicted by the symbol CL followed by the futures contract expiry month. Typical spreads for crude oil CFD’s range between 1 through as low as 0.04 points. Some brokers offer fixed spreads while other brokers offer variable spreads. Crude oil spreads widen during late US through early Asian session with London through US session offering the tightest spreads. Expect to see spikes in crude oil spreads during the EIA crude oil inventory report. For most part, overnight swaps are positive for long positions and negative for short positions. Contrary to popular opinion, trading crude oil inventories is not as simple as buying on a lower than forecast or selling on a higher than forecast report. The chart below gives one such example where Oil prices rallied despite the weekly inventory report showing a build up. LMAX Exchange: This MTF broker offers variable spreads on Crude Oil trading with spreads during peak hours dropping to as low as 0.04 points. There is a commission of $8 for 1 lot ($0.80 for 0.1 lot). Trading is offered via MT4 platform. The minimum deposit amount is $1000. Besides Crude Oil, traders can also utilize stock options trading in binary options because the Crude Oil inventories report does affect the stock value of the oil companies as well. 24Option offers Above/Below binary options where you only need to select if the crude oil price will end up above or below the current market price. The returns for trading Crude oil with 24option offers between 220% to 360%.